Step up to the plate with the Axe Pro Maple baseball bat! The ergonomic shape of the Axe handle provides better leverage and better extension while eliminating the negative force generated by the traditional knob during each swing. This in turn is scientifically proven to provide overall better bat speed. This design promotes a palm up/palm down contact position, leading to a greater consistency of correct swings. Now, you can swing the unique Axe design in a professional grade maple hardwood. The L118 features a 271 turn and cupped end along with the hardest maple in the industry. The Axe is approved for everyone from T-ball to the Pros. BADEN AXE BATS NOW PRO APPROVED! Get your hands on the all new AXETM Pro Maple Wood Official Baseball Bat M-271. It's set to revolutionize everything you thought you knew about bats. With a new ergonomic shape design, the Axe bat provides better leverage and better extension. It eliminates the negative force generated by the traditional knob during your swing, giving you unparalleled bat speed. With the new Axe bat, you'll achieve greater barrel accuracy, promoting a solid palm up/down contact position, and a better follow through with a smooth release. Baden's AxeTM line of baseball bats have received full approval by the Pros to be used in games for the 2010 season. Full approval was granted after players in spring training expressed sufficient interest in using Axe bats during the 2010 campaign. "Pro approval is a significant step in the development of this revolutionary new bat line," said Michael Schindler, Baden's CEO. "The Axe handle offers real benefits to the players in terms of grain alignment, bat control and injury prevention. With Pro approval, now the best baseball players in the world will have access to a bat that could give them a competitive edge." AxeTM bats differ from traditional bats at the knob and lower handle. Rather than the traditional round knob, this shape has been ergonomically designed to fit flush in the lower hand. Roughly resembling an axe handle, the new shape gives the batter better leverage and extension. This fit also helps reduce bruising of the palm, potential injury to the vulnerable hamate bone and general hand fatigue. Another benefit to the AxeTM is that it automatically aligns the proper wood grain to the hitting surface of the bat. Proper grain alignment insures optimal performance and reduces the risk that the bat will shatter upon breaking. 31", 32", 33", & 34"
Patented Axe Handle: The Axe handle sits flush against the bottom hand for a more natural fit that promotes more consistent swings. Coaches—getting burned out from hours of pop flies and ground balls? Then try the lightweight L10535C Axe Fungo! The Axe is hailed as a breakthrough by players and coaches from youth leagues to the pros. The handle reduces pressure on the hamate bone and provides an ergonomic shape molded to fit your hands which in turn, results in more infield/outfield drills and less hand fatigue. It also allows you to have better bat control to get the most out of your practices. Already in the hands of the pros, the Axe made its debut on the fields of Spring Training last week. 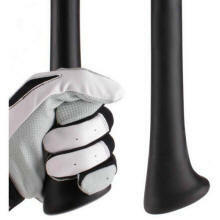 Touted by MLB legend, John Kruk, Kruk says of the Axe, "Love the handle of the Axe bat...fits perfectly in your hands." Check out this videooof John Kruk talking about the Axe.. Sounds and feels rock hard! The Axe™ Premium Hard Maple Composite adult bat is approved for play in all adult leagues under the new BBCOR.50 regulations.